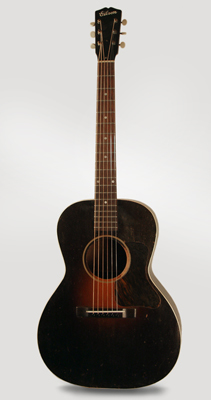 Gibson L-0 Model Flat Top Acoustic Guitar, c. 1934, made in Kalamazoo, Michigan, sunburst top, dark back and sides finish, mahogany back, sides and neck, spruce top, rosewood fingerboard, black tolex chipboard case. 7/12/2014 Osei has. Overall length is 40 in. (101.6 cm. ), 14 3/4 in. (37.5 cm.) wide at lower bout, and 4 3/8 in. (11.1 cm.) in depth at side, taken at the end block. Scale length is 24 3/4 in. (629 mm.). Width of nut is 1 11/16 in. (43 mm.). This guitar is fairly well worn overall, but has no major damage or repair. All original with no changes or alterations except a recent neckset and refret. There is a small repaired spot on the rim just above the endblock where the wood was punched in a bit but all is cleanly realigned, with no added finish. No top cracks, only one small back crack which is a good level of preservation for this very lightly built guitar. There is some dirt and wear to the top, most notably the finish is worn from the bottom edge of the soundhole rim. There is a lot of wear to the back, and quite a bit of capo wear to the back of the neck. This is a truly great sounding and playing instrument, exceptionally light and responsive. This is not the loudest L-0 we have had but has a mellower, sweeter sound than many. Overall Very Good + Condition.